2004  Postcards From Buster I co-wrote the lyrics for the opening theme song which was sung by Wyclef Jean. 2003  Caillou - Holiday Movie Soundtrack. I wrote a song on this CD called "Big Hugs From Far Away" available through Sony Music. Mental Block is a Zone 3 Production. I co-wrote and played guitar for the opening and closing theme song for the television series. The show will be aired for at least two seasons and will also be translated and broadcasted in France. Arthur is one of the most popular kid's shows on TV around the world. Since 1995 to present, Ive contributed countless creative performances (on the over 6 hours of library) for this number one animated television series which airs on PBS. Ive also co-written songs for the Backstreet Boys It's Only Rock'n'Roll Special and the Hammer Episode ("Whos the moose, on the loose"). My understanding of the songwriting process and my being a multi-instrumented musician (guitar, piano, mandolin, banjo, harmonica, ukulele) has contributed greatly to the music cues. I am pleased to note that friend Raymond Fabi, the main composer, recently received an Emmy nomination acknowledging outstanding music for this series. Didi & Ditto is a CD-ROM created by Kutoka Interactive using Softimage 3D animation. I provide some of the forefront character voices for this first of many software based series of learning adventures created for children. Kutokas products can now be found in over 40 countries and in 12 different languages and have received over 70 national and international awards. 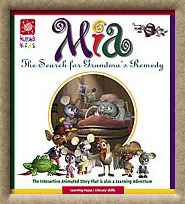 Mia is a series of four interactive multi-award winning Kutoka CD-ROM's created for children ages 5 to 8. I can be heard as one of the main characters Scary, who provides narration for the first three captivating tales. I also supply instructions on the fourth Click and Create CD-ROM. Throughout each production, I did quite a few other character voices. 'Scary' also sings the catchy theme song in The Search for Grandmas Remedy. Keep a close watch on your TV guide. The intention is to bring these characters to your living rooms. 2001  Mia, Just in Time! Garou and the Untouchables is a successful R&B band. I subbed as the guitarist playing the top circuit in and around Québec. Garou, a friend and the lead singer of the band, is currently signed with Céline Dion and René Angelil (CDA Artist Management Inc.). Sang and played guitar alone on the demo song The Ballad of Buster Baxter which was then presented to Art Garfunkel. This pitch assisted in getting him to be the voice of a singing/narrator moose for Arthurs Episode #51. Finally sung by Art Garfunkel, the tune eventually made its way to the airwaves on November 16th. 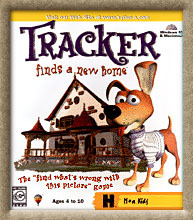 1997 - Tracker Finds a New Home, is another interactive CD-ROM by Kutoka created for children. I edited the lyrics and sang the theme song. Janis was a Janis Joplin Tribute. I gigged the top circuit in and around Québec playing piano and B3 organ in the band. Are You Afraid of the Dark?, is a 91 episode TV series sold to top-broadcasters in more than 133 countries. By special request, I dropped by with a guitar and a bag o' marshmallows to play the campfire music heard at the opening of some of the episodes. Copyright© 1999-2003 Tunein Music All rights reserved.